The No. 3 looks similar to the No. 4, but with the very important difference and it has non-motorized handwheel ink distribution and automatic grippers. The latter “feature” means that it lacks a gripper pedal, and requires the operator to roll the carriage forward to raise the grippers, then roll carriage back to meet the paper. The cabinet and cylinder trip lever was redesigned in 1938. 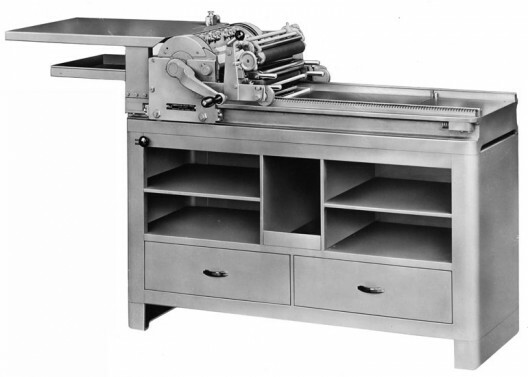 A .070″ cylinder undercut and traveling sheet delivery tray is standard. Maximum form: 14 × 18″; maximum sheet: 14 ¾ × 20″. There are sixty No. 3 presses in the Vandercook census.